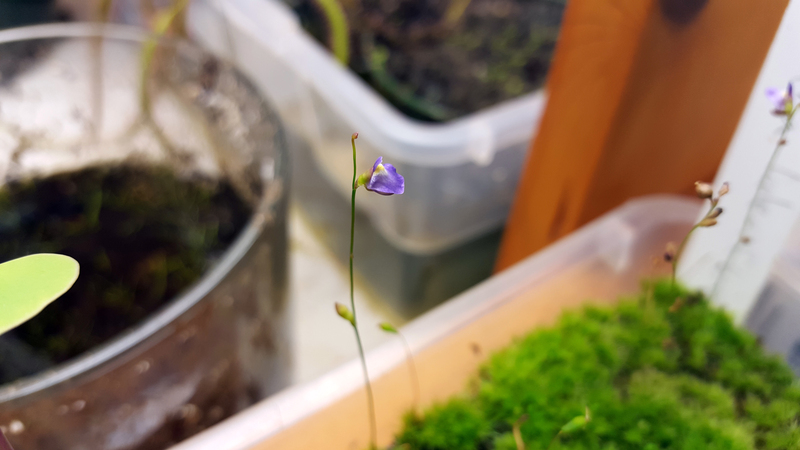 Utricularia 'Betty's Bay' in flower |Sundews Etc. Fun new utric flower today. Utricularia 'Betty's Bay' is a location form and cultivar of Utricularia bisquamata that is notable for having flower much larger than the common weedy form, and also for not readily self-seeding. Here's a photo of its flower next to a standard U. bisquamata stalk I plucked. The color is a bit richer too! Regular U. bisquamata is on the right, U. 'Betty's Bay' on the left. I think the flower stalk I'm holding got tilted forward as I was taking the picture, so it looks larger than it should. Even with that, it's clear to see that U. 'Betty's Bay' is definitely a superior clone! It's very pretty. 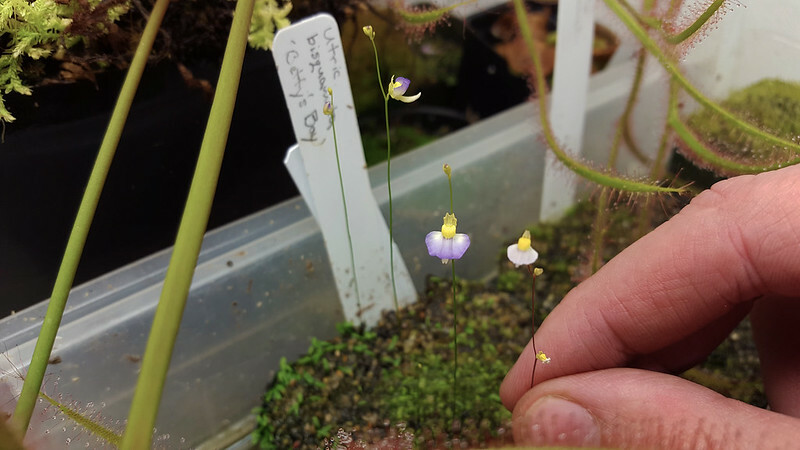 We're really really close on this Utricularia praelonga! You can see the color of the petals! It's gonna pop tomorrow or the next day. I'm stoked. The neighboring pot of Utricularia lateriflora has some lovely blooms as well. 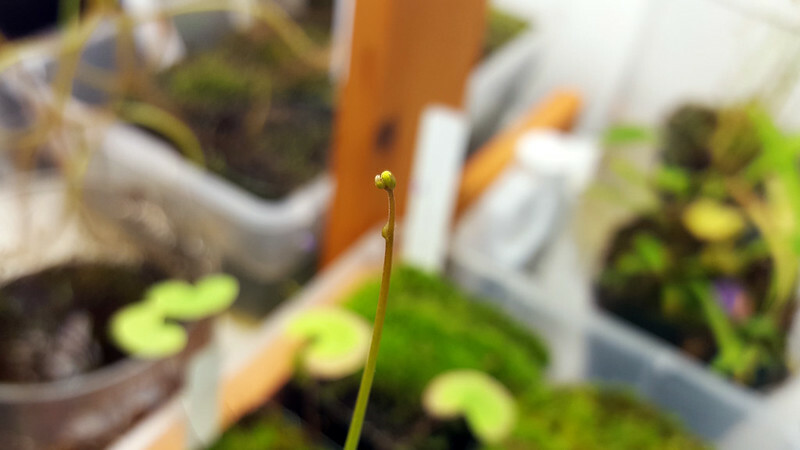 I've never been disappointed by a new Utricularia. I love the combination of dark purple and white. This is a great little utric! Finally, here's something weird. My Drosera filiformis Florida red is apparently still alive. This is my white whale. This plant keeps going dormant forever, but keeps not dying. If I were better at pot upkeep I would have thrown this away 2 or 3 times by now. Guess you should never clear out your collection ever! I hope I can get this one to grow in a bit. Looking forward to seeing your praelonga flower. Also, I have a final on the day of the show. I will try to make it in the morning but I'll probably have to leave around 12:30. You might want to try growing the Drosera filiformis 'Florida red' outside if it isn't enjoying the lights.It's probably confused on when it should go dormant without a temperature and photo-period change. They love full sun and lots of heat, and they are surprisingly tough during the winter. It might help it to be a bit more stable, if you want to try it. I just read your entire blog today. I now 1) wish I were still living in the Bay Area, and 2) want like eight million new plants. I was never that into bladderworts, but you've convinced me. Now I just need to find some in the mid-Atlantic. 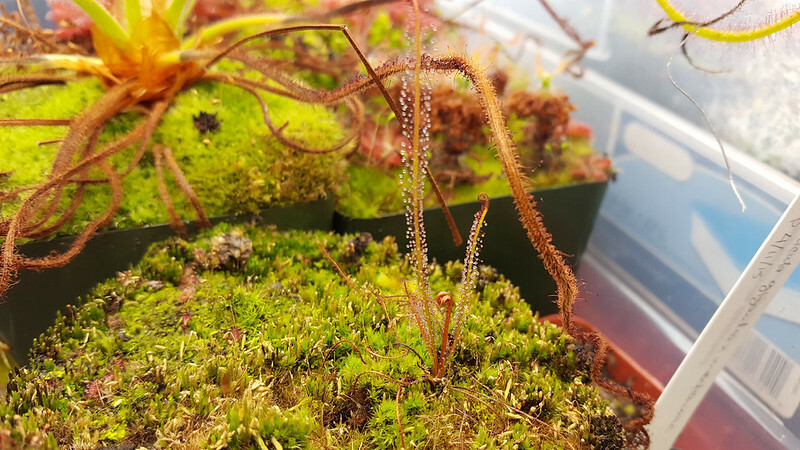 Also, after killing my Drosera intermedia, I have been without sundews and this blog has 100% convinced me that I've made a huge mistake and need to get some, too. Feel free to email me at sundews.etc@gmail.com. I'm always happy to sell or trade plants. Glad you like the blog so much!